The Mercure hotel team is pleased to welcome you. Located by the port, all our rooms offer a private balcony with views over the port and sea. Take advantage of this unique location for both leisure and business stays. 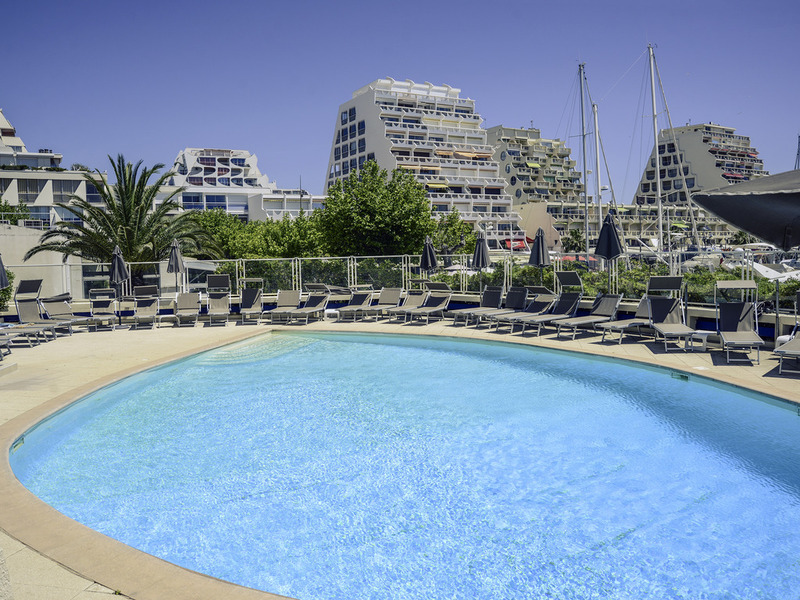 Located directly on the hairbor view, Mercure la Grande Motte offers a prime location facing the sea. Come to relax and discover the area with an easy acces to Montpellier, La camargue, Nimes with its historic monuments. Admire the sea view from your balcony. Choose between the Standard Room or Privilege Room and satisfy your every wish and desire. Terrace overlooking the swimming pool and La Grande-Motte port. Great location overlooking the harbour and sea, near all restaurants and beach. Room spacious, although a little dated, but had everything we required. Balcony excellent scenic sun trap and perfect for eating our breakfast. Staff friendly. Would stay here again. Big bedroom, hotel built in the 70's. Clean and well equiped, perfect view over main harbour. Breakfast a little strange, not enough staff who do all they can, but need a boss on site. Big breakfast room with everything all over the place , so lots of back and forth movement. At least four hot drinks points, very positive, but no-one at the entre point and the regester/log never used. Perfect car park and perfect central situation. I had a wonderful time. I thought the amenities in the room were very intentionally chosen - the phone wasn't high tech, for example - but I didn't and I suspect few people care about the phone. The bed however was very nice, as was the shower, and the lighting, and the balcony. I found the room to be perfect. The only thing I wish is that the bar and restaurant and room service were open - but I understand that in Montpellier everything like that closes in the wintertime. Very well reception and house keeping services. Openning of the restaurant was very limited; breakfast daily and for the rest almost always closing. Also the life span of the sanitary has been reached its end; at least the tap and the sink. This is something we keep experince it each time we are visiting this hotel. The car parking is fine howeverwould perfer to have it for part at least covered for better protection. The hotel is really directly on the sea, at the port. The location is perfect to access all the center of the city. Our room had a beautiful sea view ! The rooms are comfortable, clean, the bed is great, and the room is very very quiet. The staff was very nice, the breakfast was following Mercure standards. The only minus point is that the hotel design is pretty old, and the room including bathroom need now to be refreshed. As usual, we were well satisfied with room, common space, staff. We enjoyed a Junior Suite and the usual very good Mercure breakfast. Everything was as we expect from a Mercure and La Grand Motte in November with 14C was very quiet and pleasant. Only two issues that give it 4 - a) the dining room was closed for private use on two out of three nights yet we only found out when we found the doors closed a simple note under the door or a briefing on arrival would not have bee amiss B) our suite was very good but due to the concrete construction the wi-fi was very poor, more routers needed. Breakfast menu did not change in five nights. The hot selection was sub-par. Fantastic location, dated bathroom facilities, building needs cosmetic maintenance. I liked the bedroom with the view - breakfast is too expensive - please make various choices with various tariffs - too busy in the room for breakfast - no privacy the place is beautiful and staff very nice very pleasant stay - (we 've been already there 3 times). Instead of using proper soaps, Mercure now offers soaps in dispensing plastic bottles. Not really my favourite. Prefer to pay a bit more, and have proper soap. Staff was helpful in providing me with a Nespresso machine, probably thanks to my Gold Membership. It was everything we expected and we were very happy with our stay. The hotel and room were very clean and the restaurant offered very good food. Staff at reception were excellent. Rooms were clean and a great view. Very good breakfast. Room was fine however staff service was poor, at breakfast tables were not cleared and food not replenished unless asked for, trying to buy drinks at lunch time painfully as staff not attendant and needed to be chased. Not the type of service I expect from Mercure/Accor hotels. Disappointing.